Megan is 11 years old, so the mitts needed to be narrower than a full round on the blue KK loom. I used 18 pegs on the first, then realized I really needed 20, which is what the bottom swatch is. *Basic Chain Cast on (20 pegs) using 2 strands WW held as one. *Rows 1-4: fine gauge (not e-wrap) garter stitch: knit one row, purl one row…repeat. *Rows 5-28: basic fine gauge ribbing…K1, P1, K1, P1…repeat all pegs, all rows, keeping knits above knits, and purls above purls. *note: this number of rows may need to be adjusted for wrist/hand length! *Final Step: Stitch sides together, leaving 4 rows open for the thumb holes. 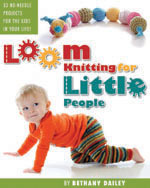 This entry was posted in Free Loom Patterns, Kids, Knitting, Loom Knitting, New Projects, Tutorials. Bookmark the permalink. I think your mittens are very cute, my daughter would love them. I am pretty much a beginner (I’ve made a lot of hats…lol) but I want to start doing other things because I am getting quite bored. My question is, how do you stitch them together. Do you use yarn and a yarn needle? What stitch do you use. I hope you enjoy! Let me know how those mitts turn out… I always love new photos to display on the Clique Pics page! I found this recently to do for my daughter and i love it. I could not find a fine gauge cast on (at least I think it’s a cast on). I did do it with just e-wrap but I would really like to know what the fine guage is. I’m so glad you’re enjoying this simple-yet-successful project…it’s a great way to whip out fingerless mitts in a hurry on your looms! As for the “fine gauge method cast on”…this was an early term of mine to differentiate between the e-wrap co and the other ways available to create a smaller, non-loopy cast on edge. Some great ones available are the: crochet, chain & cable cast on.